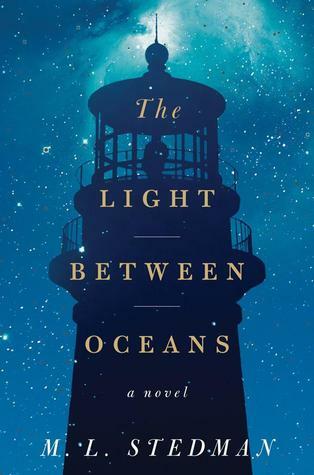 The Light Between Oceans is a gripping story filled with fallible yet decent characters. Even though I felt driven to continue reading I was filled with a sense of dread—knowing there were going to be repercussions for the decisions that were made. Not knowing how high a price Tom, especially, was going to pay for wanting happiness for his grieving wife, Isabel. Ultimately, I am pleased I was able to finish (within one day) and quite relieved by the postscript style ending. I'm quite impressed by this debut novel and look forward to reading more of M.L. Stedman's work. "The wind never finishes. Sometimes it disappears, but only to gather momentum from somewhere else, returning to fling itself at the island, to make a point which is lost on Tom. Existence here is on a scale of giants. Time is in the millions of years; rocks which from a distance look like dice cast against the shore are boulders hundreds of feet wide, licked round by millennia, tumbled onto their sides so that layers become vertical stripes." More. The Fault in Our Stars is so much more than can be properly described. More than can accurately be reviewed. 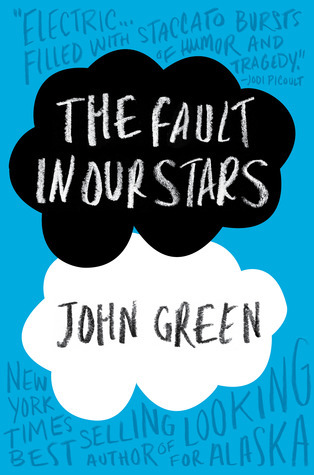 It touches so many emotions so beautifully that I found myself laughing uncontrollably while Hazel, Augustus, and Isaac discussed (jestingly) Having Cancer. Only to sob uncontrollably when the loss was unmeasurable. The intelligence, strength, humor, empathy, and love that was demonstrated by Hazel, Augustus, and their families took my breath away. 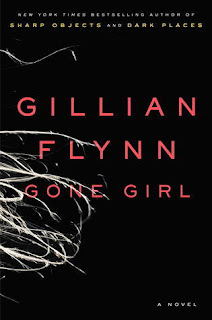 This is a superb work of fiction that deserves admiration, awards, and to be read again and again. MY THOUGHTS I cannot deny my appreciation for this brilliantly crafted tale. The alternating perspectives—Nick's in the present and Amy's ascending chronological diary entries—kept me fully engrossed. I can't recall being this equally discomposed by the main characters in any previously read novel. Amy and Nick may have outwardly appeared to be fairly regular people, but reading their respective psychotic and narcissistic thoughts were very discomforting! I thought the author's use of parenthetically descriptive phrases and insertion of quizzes into Amy's diary entries was ingenious. I'm a reader who seeks out books with promising endings. 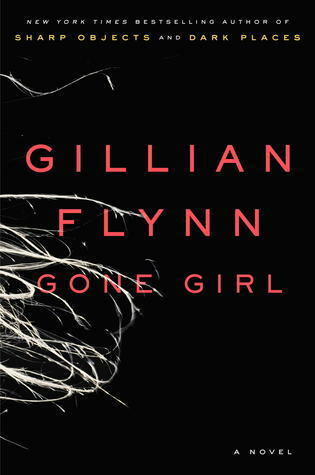 Even though I felt hopelessness and bitterness were the prevailing emotions in Gone Girl, and the ending was quite unsettling, I shall not regret my discovery of this very gifted author. Folk art museum curator, rancher and sometime sleuth Benni Harper is back in an unforgettable new mystery, organizing a Memory Festival. But a sniper threatens to make it a day to remember in the worst way… Benni and the ladies of her Coffin Star Quilt Guild are excited to display their Graveyard Quilt at the first ever San Celina, California, Memory Festival. The fair promises to be a moving event celebrating memories through quilts, crafts, scrapbooks, photographs, written word, oral histories, and tributes to loved ones. But when a local cop is wounded by a mysterious sharp shooter with a vendetta against the police, Benni fears for her loved ones—especially her police chief husband, Gabe. Soon Benni is drawn into the search for the sniper, determined to make her hometown safe again…before their peaceful street fair becomes a shooter’s deadly target range. MY THOUGHTS I'm having mixed emotions regarding this fifteenth Benni Harper Mystery. I very much enjoyed it and feel it may be tied with Mariner's Compass as my favorite of the series. So, that explains my delight. Now, here is the reason for my angst. I fear this may be the final book in the series. 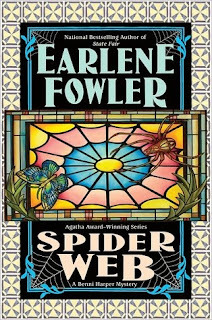 Earlene Fowler did a Facebook Status update on August 4, where she stated she might not be publishing for a while (after The Road to Cardinal Valley is released in December). That along with Spider Web's comprehensive epilogue leads me to believe I've just closed the book on a seventeen-year-long friendship. If this is indeed the end I must say it was beautifully finished. There are two distinct mysteries—one to do with a sniper and the other to do with a new woman in town. Benni is in the thick of things and curious, as usual. I particularly enjoyed the preparations and interviews for a book that Benni is helping Isaac with, and for the theme of the Memory Festival. Benni is all about history: recording and preserving it and respecting traditions. As usual, she is busy with her job, friends, family, and involved in a mystery. Gabe is having violent stress-induced nightmares (triggered by the sniper attacks) that leads him to protect Benni by sleeping apart from her. They deal with it the best they can, and ultimately Gabe seeks the help of a psychiatrist Benni had recently met. Although that female stranger has a connection to someone important to Benni it is not in the way she imagines. There are significant changes ahead for Benni and her family at the close of this story, but nothing will ever change the true nature of these colorful and respectable characters. How I've enjoyed my time with them!